, a learned prelate, was born in 1663,at Lichfield in Staffordshire, where his father | followed the business of a dyer, but appears not to have been in opulent circumstances, as he was unable to give his son a liberal education. For this our author was indebted to the celebrated antiquary Ashmole, also a native of Lichfield, who, discerning his capacity, sent him to Westminster-school in 1G78. Here he was soon distinguished as a young man of parts and application, and acquired particular notice by the classical turn of his exercises. Two years after, he wrote two elegies, one in Latin and the other in English, on the death of Lilly, the astrologer, out of gratitude, we are told, to his patron Ashmole, a great admirer of Lilly. Whatever the poetical merit of these elegies, we may say, in reference to the subject, that they would now be thought ironical. In May 1682, Mr. Smalridge was elected from Westminster-school to Christ-cburcb, Oxford, where having taken his degree of 13. 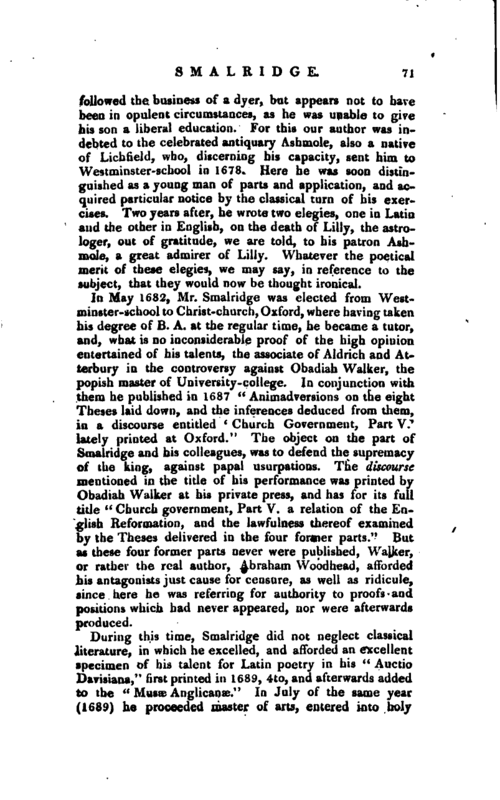 A. at the regular time, he became a tutor, and, what is no inconsiderable proof of the high opinion entertained of his talents, the associate of Aldrich and Atterbury in the controversy against Obadiah Walker, the popish master of University-college. In conjunction with them he published in 1687 “Animadversions on the eight Theses laid down, and the inferences deduced from them, in a discourse entitled ‘ Church Government, Part V.’ lately printed at Oxford.” The object on the part of Smalridge and his colleagues, was to defend the supremacy of the king, against papal usurpations. 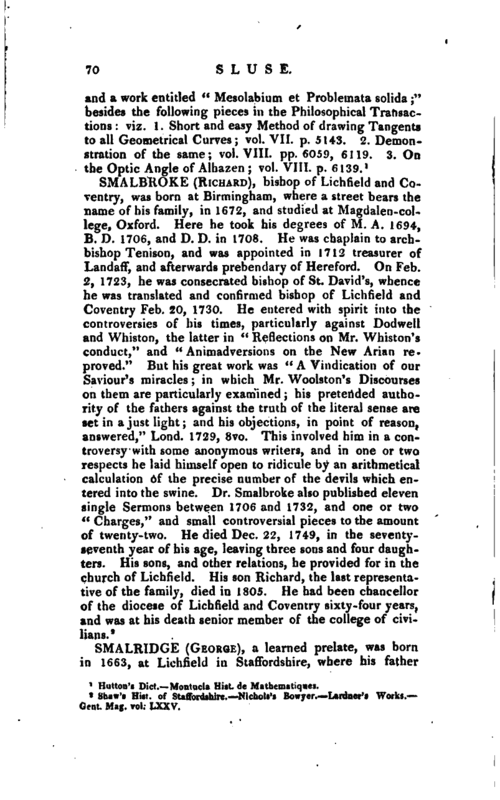 The discourse mentioned in the title of his performance was printed by Obadiah Walker at his private press, and has for its full title “Church government, Part V. a relation of the English Reformation, and the lawfulness thereof examined by the Theses delivered in the four former parts.” But as these four former parts never were published, Walker, or rather the real author, Abraham Woodhoad, afforded his antagonists just cause for censure, as well as ridicule, since here he was referring for authority to proofs and positions which had never appeared, nor were afterwards produced. During this time, Smalridge did not neglect classical literature, in which he excelled, and afforded an excellent specimen of his talent for Latin poetry in his “Auctio Davisiana,” first printed in 1689, 4to, ancNifterwards added to the “Musae Anglicange.” In July of the same year (1689) he proceeded master of arts, entered into holy | orders, and about 1692 was appointed by the dean and chapter of Westminster to be minister of Tothill-fields chapel. In 1693 he was collated to a prebend in the church of Lichfield. In 1700 he took his degree of D. D. and frequently supplied the place of Dr. Jane, then regius professor of divinity, with great approbation, in which office it being his duty to present persons of eminence for their degrees in that faculty, we find him, in 1706, presenting the celebrated Dr. Grabe (whose Mss. he afterwards possessed) in a very elegant speech. 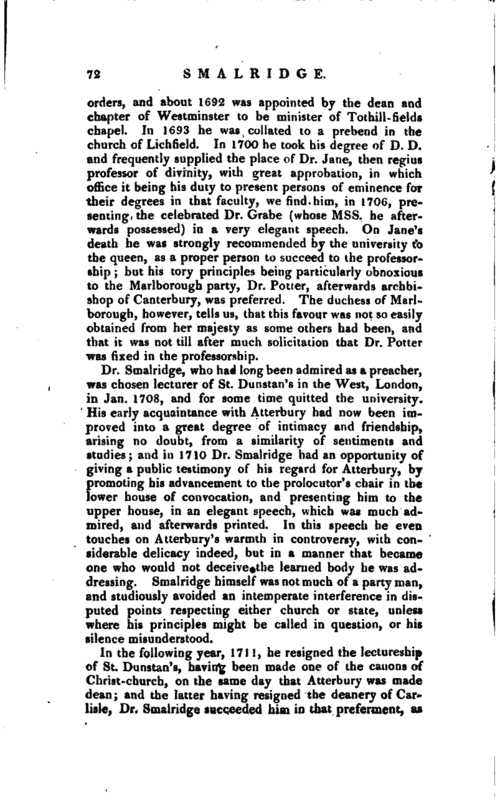 On Jane’s death he was strongly recommended by the university to the queen, as a proper person to succeed to the professorship; but his tory principles being particularly obnoxious to the Marlborough party, Dr. Potter, afterwards archbishop of Canterbury, was preferred. The duchess of Marlborough, however, tells us, that this favour was not so easily obtained from her majesty as some others had been, and that it was not till after much solicitation that Dr. Potter was fixed in the professorship. 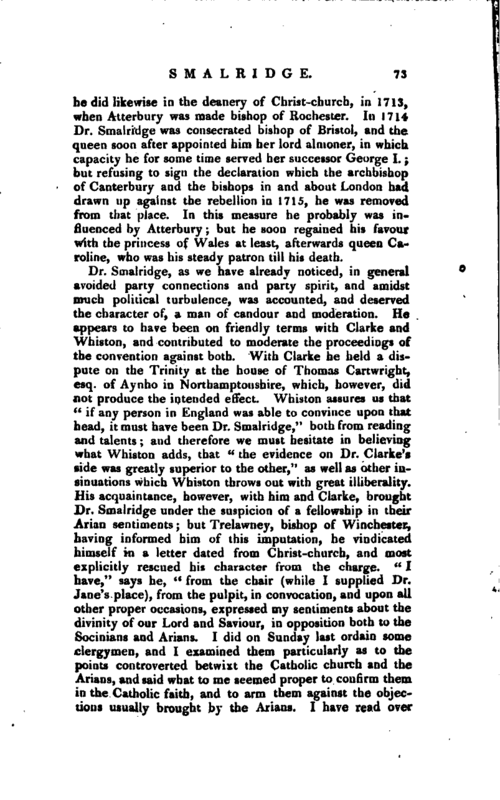 Dr. Smalridge, who had long been admired as a preacher, was chosen lecturer of St. Dunstan’s in the West, London, in Jan. 1708, and for some time quitted the university. His early acquaintance with Atterbury had now been improved into a great degree of intimacy and friendship, arising no doubt, from a similarity of sentiments and studies; and in 1710 Dr. Smalridge had an opportunity of giving a public testimony of his regard for Atterbury, by promoting his advancement to the prolocutor’s chair in the lower house of convocation, and presenting him to the upper house, in an elegant speech, which was much admired, and afterwards printed. In this speech he even touches on Atterbury’s warmth in controversy, with considerable delicacy indeed, but in a manner that became one who would not deceive the learned body he was addressing. Smalridge himself was not much of a party man, and studiously avoided an intemperate interference in disputed points respecting either church or state, unless where his principles might be called in question, or his silence misunderstood. In the following year, 1711, he resigned the lectureship of St. Dunstan’s, having been made one of the canons of Christ-church, on the same day that Atterbury was made dean; and the latter having resigned the deanery of Carlisle, Dr. Smalridge succeeded him in that preferment, as | he did likewise in the deanery of Christ-church, in 17 Is, when Atterbury was made bishop of Rochester. In 1714 Dr. Smalridge was consecrated bishop of Bristol, and the queen soon after appointed him her lord almoner, in which capacity he for some time served her successor George I.; but refusing to sign the declaration which the archbishop of Canterbury and the bishops in and about London had drawn up against the rebellion in 1715, he was removed from that place. In this measure he probably was influenced by Atterbury; but he soon regained his favour with the princess of Wales at least, afterwards queen Caroline, who was his steady patron till his death. These were almost the words of a dying man, for this letter is dated Sept. 23, 1719, and on the 27th he expired of an apoplexy at Christ-church, and was interred in the aile of the north-side of the choir of that cathedral, where some years afterwards, a handsome monument wns erected to his memory, with an elegant inscription in Latin, most probably by Dr. Freind, his brother-in-law, the bishop and he having married two sisters. Bishop Newton adds that he had Bristol, the poorest bishopric, and Christ-church the most expensive deanery in the kingdom. This seems to confirm in some degree what Mr. Skelton says in his “Hylema.” “The bishopric of Bristol is one of the lowest in point of income among the English sees. Hence it was that Dr. Smalridge, at his decease, was not able to leave even a tolerable subsistence to his widow and two daughters.” Mr. Skelton adds a | noble instance of liberality, which we have nowhere else met with. “In this state of exigence those ladies were visited by Mr. Wairtwrigbt, who had been some years register to that diocese, and had, by the profits of his place, and other practice of the law, acquired 3000l. 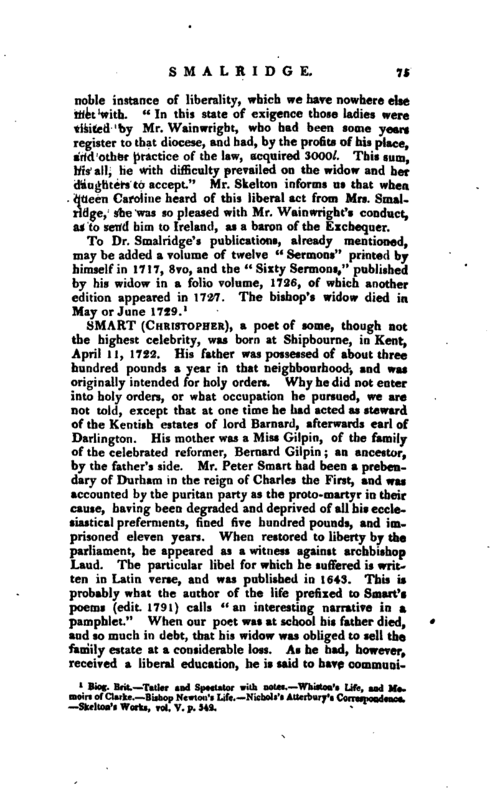 This sum, his all, he with difficulty prevailed on the widow and her daughters to accept.” Mr. Skelton informs us that when queen Caroline heard of this liberal act from Mrs. Smalridge, she was so pleased with Mr. Wain Wright’s conduct, as to send him to Ireland, as a baron of the Exchequer. Biog. Brit. Taller and Spectator with notes. Whiston’s Life, and Memoirs of Clarke. 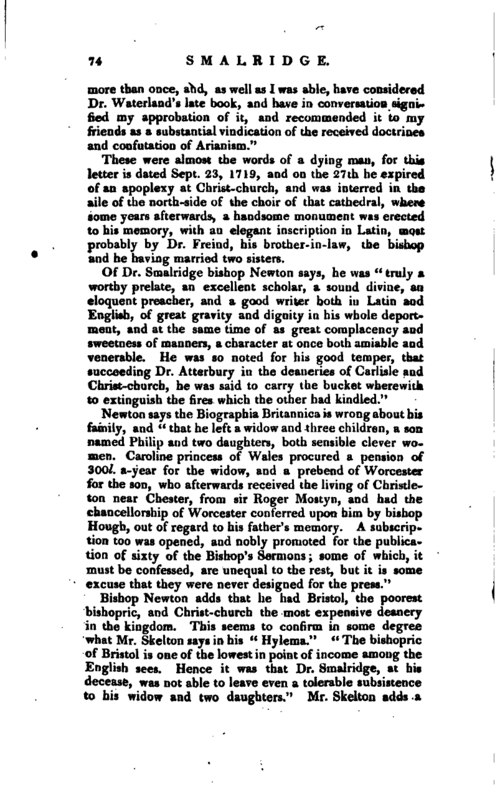 Bishop Newton’s Life. Nichols’s Atterbury’s Correspondence. Skelton’s Works, vol. V. p. 543.